The already choppy economic recovery will continue its slow advance this year, but growth will deteriorate as its primary contributors — government stimulus and manufacturing — lose steam. Furthermore, no new economic drivers have emerged to propel the recovery into a self-perpetuating expansion, suggesting below-trend GDP growth will persist through the second half. The impact of the government stimulus on GDP growth has declined slowly since peaking in the third quarter of 2009, while the manufacturing sector, which returned to expansion mode during the third quarter of last year, began losing momentum three months ago. Strength in the manufacturing sector through the early stages of the recovery was fueled by accelerating exports and business inventory restocking following the severe correction cycle; however, both drivers lost vigor in recent months. During the second quarter, exports advanced just 0.4 percent, a significant slowdown from the first quarter of 2010 and fourth quarter of 2009, when exports grew 4.5 percent and 6.8 percent, respectively. The impact of business inventory growth also declined during the second quarter, accounting for just over 1 percentage point of the overall GDP figure, versus contributions of more than 2.6 percentage points during the previous two periods. 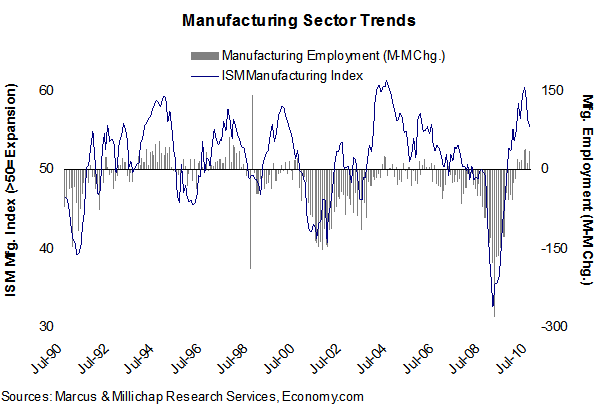 Recent manufacturing sector indicators reflect weakening but also point to a somewhat orderly slowdown as opposed to a steep drop-off, which should help keep the recovery intact. In July, a leading manufacturing index slipped 70 basis points to 55.5, though the monthly figure indicates continued expansion in the sector. These weaker index results can be largely attributed to reduced orders, a possible sign the post-recessionary boost from business inventory building has run its course. A few bright spots remain, as industrial production rose modestly in July after declining in the previous month. Autos led factory output, a positive shift after the sector’s near collapse last year. Gains were also notable in other segments, including high-tech goods and business equipment, suggesting companies are beginning to satisfy pent-up demand after a prolonged period of conservation. Industrial property fundamentals weakened considerably in recent years, and the deceleration in export activity may delay the onset of a recovery in investment performance. Fortunately, construction in 2010 will slip to its lowest level in at least 30 years, while absorption turned mildly positive in the second quarter. Combined, this will prevent further significant erosion in occupancy rates and vacancy will increase just 40 basis points in 2010 to 13 percent, following a 200 basis point spike in 2009. Healthy manufacturing-sector employment growth has helped stabilize renter demand for apartments in many Midwestern metro areas, including Cleveland, Detroit, Indianapolis and Milwaukee. During the second quarter, all of these markets recorded vacancy declines of 20 basis points or more, along with stable or modest rent growth. This entry was written by marcusmillichap, posted on August 20, 2010 at 6:57 pm, filed under Research and tagged Gross Domestic Product, Manufacturing. Bookmark the permalink. Follow any comments here with the RSS feed for this post. Trackbacks are closed, but you can post a comment.